Free Download WinRAR 5.50 latest version 32-bit and 64-bit from high speed direct download link. WinRAR is a computer application that is used to compress or extract your files or folder. It is available for all Operating Systems such as Mac, Windows XP, Windows 7, Windows Vista,Windows 8/8.1 and Windows 10. The basic purpose of WinRAR is to compress the size of your files or folder. In case, you have stored some games or software setup, it will reduce the size about 50%. But if you are trying to compress movie, songs or compressed setup files, then it will reduce a bit in size for such type of files. Another purpose of WinRAR is that it is used to upload your folder. For example, if you have multiple files into a normal Folder then you cannot upload this hole folder. You have to convert it into ZIP or RAR folder. Then you can easily upload such kind of folders. There is some difference between ZIP and RAR folder. By default, Windows support ZIP folder. You can create ZIP folder using with your mouse move. To convert a folder into ZIP, make a right click on it, and then choose Send to > Compressed (Zipped) folder. You can easily extract a ZIP folder within Windows. There is no need any extra software to extract a ZIP folder. But a RAR folder is created with the help of WinRAR. As compared to ZIP, RAR reduces the file size more. 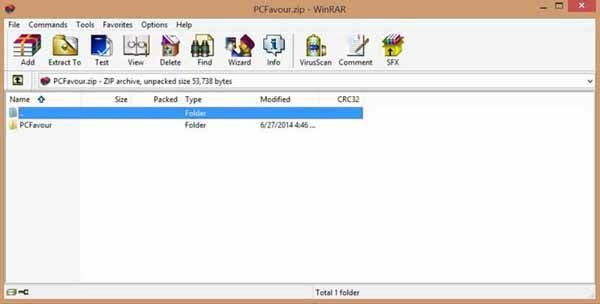 If you have a RAR file, then you need WinRAR to extract it.